Most Famous Picture in Jewish Art? 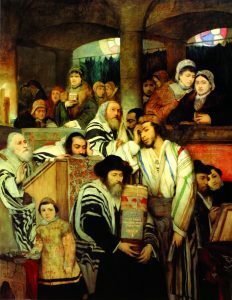 The iconic Jews Praying in the Synagogue on the Day of Atonement is the painting most widely associated with Polish Jewish artist Maurycy Gottlieb (1856–1879). 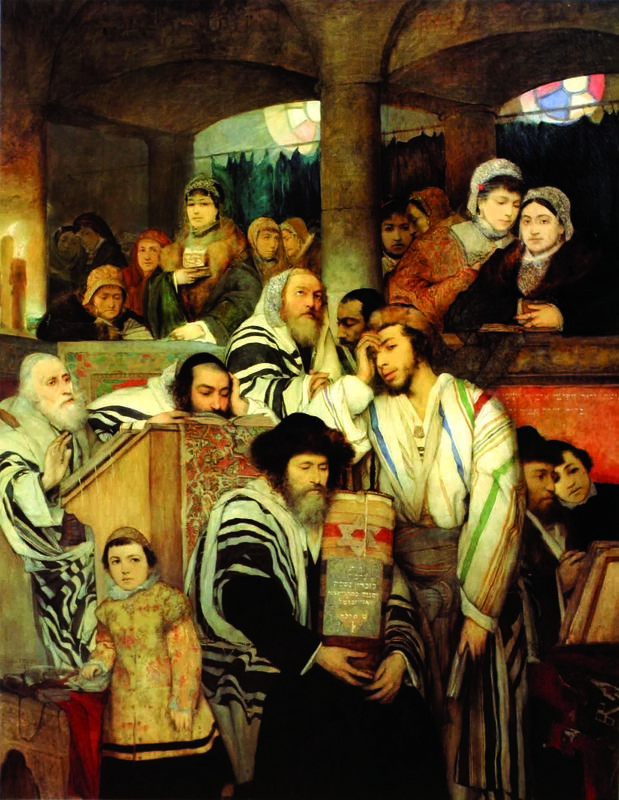 Completed in 1878, it’s been reproduced more than any other modern Jewish work of art. Gottlieb literally immersed himself in the painting, planting at least four self-portraits among the figures gathered in the traditional synagogue on this holiest day of the Jewish year. This quartet reflects his life story and the dilemmas that haunted him. One of the four is a young man wrapped in a colorful prayer shawl, standing out from the traditional black and white stripes on the other worshippers’ garb. Another is the youth behind him, leaning forward in profile over a High Holy Day prayer book, and a third is a boy in a brocade coat, looking as if transplanted from an earlier time. The medallion hanging from his neck bears the Hebrew letters mem and gimmel, the artist’s initials. 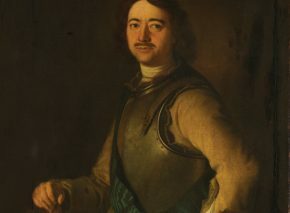 Other members of Gottlieb’s family have also been incorporated into the painting. 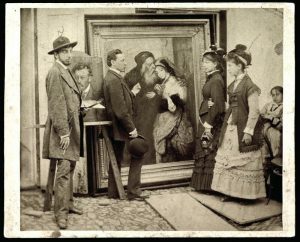 His father, on whose shoulder a fourth young Maurycy leans, is seated in the lower right-hand corner, and the artist’s fickle fiancée, Laura Rosenfeld, who broke their engagement (and his heart), appears in the unusually open women’s gallery. 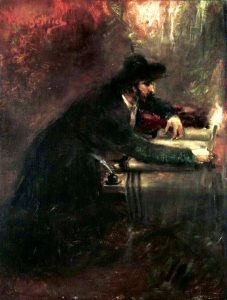 The mantle on the Torah scroll in the foreground is inscribed in Gottlieb’s memory, adding an aura of mystery: “Donated in memory of the departed soul of our teacher Rabbi Moses Gottlieb, may his righteous memory be blessed, in the year 5638.” The year is the date of the picture’s completion, not Gottlieb’s death, but it’s oddly prescient. Gottlieb himself said that he felt a hidden hand guiding his brush as he painted the inscription. The subjects’ faces are all tinged with sadness, and the central figure – Moses/Maurycy himself, head in hand – exudes more than a hint of despair. These long suppressed pangs of conscience may have found their way into Gottlieb’s signature painting. On this Day of Atonement, far from being absent, the artist is present in synagogue in multiple images. Gottlieb’s brief life began in Galicia, then part of an Austria soon to become the Austro-Hungarian Empire. He was born in the small, half-Jewish town of Drohobycz (now Drogobych, in Ukraine). The nascent oil industry boosted the town’s economy in the second half of the 19th century, and Maurycy was a child of the resulting hodgepodge of languages, religions, and ethnicities: Catholicism and Greek Orthodoxy; traditional Judaism alongside a secular, cultural Jewish identity; a babel of Polish, German, and Yiddish in the air; Poles and Ukrainians each forging rival national identities. 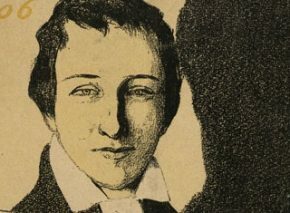 Gottlieb was clearly torn, his personality split by his various names: Moishe for Jewish occasions, Moses or Moritz in a German context, but above all Maurycy, as he was known in Polish. The Gottlieb family might today be described as “modern Orthodox”: observant but somewhat integrated within Polish culture. Moishe-Maurycy’s parents were proud Poles as well as proud Jews, so when their son abandoned Orthodoxy, they didn’t disown him. After all, the general education they’d given him had laid the groundwork. 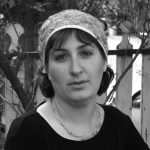 In fact, of the seven children of Fanny and Isaac-Itzik (a textile merchant turned oil refiner), four sons were artists, one became a lawyer, and one daughter was a teacher and amateur pianist. Another daughter married a non-Jewish Polish artist, which probably bothered her parents more. All but one of the Gottlieb children went by Polish names: Maurycy, Leopold, Marcin, Anna, Jadwiga, and Filip; Haim was the exception. 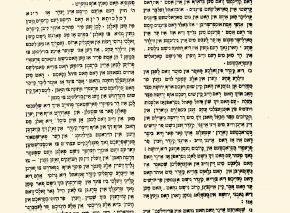 Though Maurycy began his education in a heder, where he learned to read Hebrew and studied basic Jewish texts, his parents sent him to a Christian elementary school and high school. There he was exposed to his classmates’ anti-Semitism. 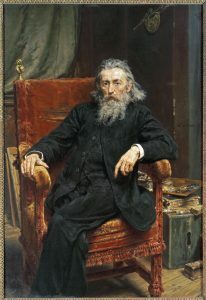 He transferred to a German high school in Lvov and was admitted to the prestigious Vienna Academy of Fine Arts in 1872, at the tender age of fifteen. He worked hard to be accepted among his fellow Poles, struggling to perfect his Polish, but like many of his Jewish contemporaries, it was much easier for someone whose mother tongue was German to integrate into German culture. Gottlieb rounded out his elementary knowledge of Judaism by reading voraciously on Jewish history. Like many of his generation, he devoured Heinrich Graetz’s path-breaking History of the Jews. Gottlieb joined the Vienna Academy’s Department of Historical Art – then an extremely popular genre in which artists painted historical events and dramatic scenes from literary classics. He studied under many first-class artists, but it was a picture by Polish master Jan Matejko that truly inspired him. Matejko’s Rejtan: The Fall of Poland (1866) shows the fateful meeting of the Polish sejm, or parliament, in Warsaw in 1773, in which its members acceded to the first shameful division of Poland – a prelude to the complete loss of Polish independence. 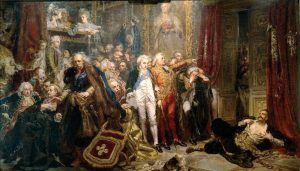 Delegate Tadeusz Rejtan has thrown himself to the floor, symbolizing his country’s fall into Russian, Prussian, and Austrian hands, while other political leaders look on and the king, impatient and helpless, steps away from his throne. Jan Matejko, Rejtan – The Fall of Poland, oil on canvas, 1866. The emotional power coursing through this romantic, tragic work made an indelible impression on young Maurycy Gottlieb, who even then may have found the Polish nation’s fate not unlike that of his own long-suffering people. He stood hypnotized before the painting, “until the spark of art burned in his soul” (ibid., p. 30). There and then, reversing the path trodden by most aspiring Jewish artists of his era, Gottlieb decided to leave Vienna for the relative obscurity of Galicia, studying at the Kraków School of Fine Arts under Matejko himself. The fierce patriotism of Gottlieb’s mentor, Polish artist Jan Matejko, profoundly influenced Polish nationalist paintings in the 19th century. Self portrait, 1892. 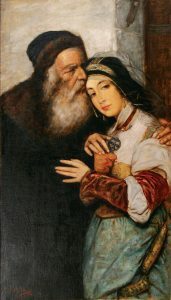 Shylock and Jessica, painted by Gottlieb in 1876. The artist’s one-time fiancée, Laura Rosenfeld, inspired Jessica’s face. As presented by Samuely, this Jewish nationalist cautionary tale reminiscent of Dreyfus and Herzl should be taken with a grain of salt. Gottlieb was already interested in Judaism before his arrival in Kraków, and far from relinquishing his universal vision, he continued to strive for acceptance as a Polish artist. “I am a Pole, and a Jew,” he frequently said, “and I wish, God willing, to work for both” (ibid., p. 34). But the anti-Semitic incidents he experienced clearly moved him to paint his people in a romantic light. The hostile atmosphere of Kraków eventually caused Gottlieb to move on in pursuit of artistic excellence: first back to Vienna, then on to Munich and Rome, and finally returning to Kraków. These migrations made him famous – hailed by the Polish and the Jewish press, feted by Jewish organizations, and befriended by other Polish artists. But his success was short-lived. 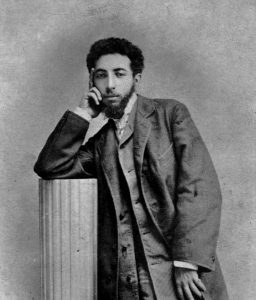 Maurycy’s love for Laura Rosenfeld – whom he met in 1877, when he was just twenty-one – ended disastrously when she broke off their engagement. Gottlieb had always suffered from bouts of melancholia, hinting that only his devotion to his family prevented him from taking his own life. In 1879 he became romantically involved with a young woman named Lola Rosengarten, but that same summer he took to his bed and died shortly afterward, at age twenty-three. His sudden death was attributed variously to complications arising from an ear infection, angina, or a neck growth, but his depression also sparked rumors of suicide, which Rosenfeld herself believed. Either way, Maurycy Gottlieb’s brief life ended suddenly and mysteriously. He was buried in the Jewish cemetery in Kraków, but his artistic legacy lives on. Gottlieb’s work ranges from portraits and contemporary settings from both Polish and Jewish society to biblical scenes, drawing on the New Testament as well as the Old, and even the Apocrypha, such as Holofernes’ death at the hands of Judith. Like many of his generation, Maurycy was fascinated with the Orient, which often provides the backdrop to his pictures. But most of all, as he himself proclaimed, he painted his own people – Jewish weddings, Jews dancing and praying, etc. ‘Torah Scribe’, oil on canvas, 1876. Envisioning Jewish integration into Polish society, he sketched the Polish legend of 14th-century king Casimir the Great and his Jewish mistress Esterka, echoing the story of the biblical Queen Esther. Gottlieb planned a masterpiece representing the Jews’ arrival in Poland during Casimir’s reign, but the artist’s untimely death interfered. Constantly questioning his identity, Gottlieb painted numerous self-portraits, depicting himself in Arab garb, as a Polish nobleman, and as a Persian king in Ahasuerus, the Wandering Jew. Some of Gottlieb’s subjects are surprising, often part of his determination to combat intolerance through his art. One example is Uriel Da Costa, a Portuguese Jew from a converso family who returned to Judaism in Amsterdam but was ostracized and humiliated by its Jewish community for his heretical views, eventually committing suicide. Another is Shylock, the infamous Jewish moneylender from Shakespeare’s Merchant of Venice, whom Gottlieb renders as a sensitive and loving father embracing his daughter. But the most unexpected recurring figure in Gottlieb’s art is Jesus. Though reviled by the traditional Jews among whom Gottlieb grew up, Jesus appears sympathetically in two of the artist’s major unfinished works, Christ Preaching at Capernaum and Christ before His Judges. Both paintings were influenced by an artistic trend toward portraying Jesus as a normal human being in the Oriental setting of first-century Judea, rather than the heavenly figure of European sacred art. Free of Christian associations, Gottlieb’s Jesus becomes a Jew among Jews – a double irony, since he worked on both pieces while living in Rome, the birthplace of religious anti-Jewish sentiment. 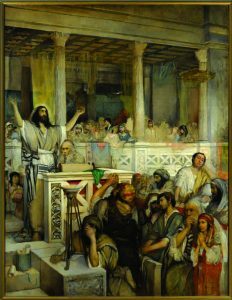 Christ Preaching at Capernaum includes a Roman visitor among the Jews gathered to hear the sermon, and a prayer mat depicting the Dome of the Rock hangs over the balustrade behind the preacher. In a picture set centuries before the birth of Islam, this anachronistic detail presumably represents a vision of uniting nations and faiths. Naturally, Maurycy too appears among the listeners as Jesus preaches. Though most of the congregation looks bored or indifferent, Gottlieb’s face is pensive – as in his Jews Praying in the Synagogue – as if he doubts the dream of a better humanity will ever come true. Gottlieb’s Jewish world has a distinctly nostalgic beauty, suggesting a culture already in decline. 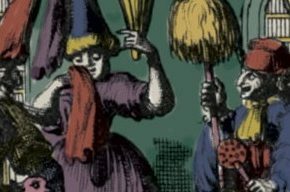 He himself always appears as an “other,” dressed like a visitor from another era. Gottlieb never quite resolved his identity, and his self-portraits preserve his musings for posterity. Maurycy Gottlieb, Letters and Diaries, trans. 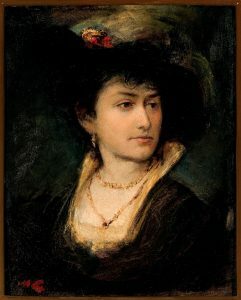 Mordecai Narkis (Jerusalem, 1956) [Hebrew]; Nehama Guralnik, ed., In the Flower of Youth: Maurycy Gottlieb, 1856–1879 (Tel Aviv, 1991); Ezra Mendelsohn, Painting a People: Maurycy Gottlieb and Jewish Art (Hanover, NH: Brandeis University Press, 2002).